I don't like violence. So is the same with choices of movie. Unless there is Keanu Reeves in it. Or, Iko Uwais ... but let's save the latter name for another review. We cannot compare silat with kungfu (or gun-fu in this matter). 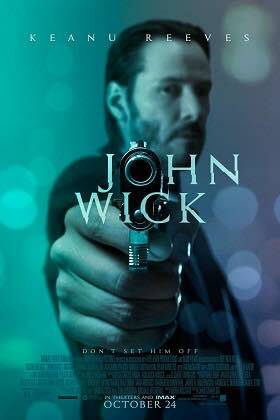 Besides, that is not the violence which attracts me to watch John Wick. It is Keanu (and let's hope my husband does not read this writing). Pun intended, of course. I am romantic at heart. So, for me everything has to has a cause. Letting things go by without a good cause is painful. Any good cause keeps the world go around. It keeps us alive ... to live in hope, despite all the darkness. To tell us, "Every cloud has as silver lining". So, what is the cause of John Wick? It is about a second chance ... to have a life, to feel love, and being loved too. The film tells a story with economy on words. There are not much dialogues to remember. But once they happen, it is quotable quote worthy. Watching the film running is like reading a bedtime story for a toddler, where the book has beautiful and clear illustrations about what is going on. There is no need to describe or explain anything. Just sit and watch, then let the story unfolds. Each scene unfolds like coming from different universes. The calm universe of John's house. The hyperrealism of assassins' underworld. The hype and vibe of colorful nightlife in an unnamed metropolitan city. The rustiness of an abandoned military field. The washed away helipad spot in a heavy rainfall at night. Let's not forget how awesome the Continental is. The only cozy spot in which killers can have a drink, eat, sleep, and mingle with each other without fear of being killed. It is all for a stash of gold coin, to be sure. The scenes are always taken from 2 different points of views: the audiences perspective ... and John Wick's eyes. From our eyes, he is like living a world of wonders, where everybody nods at him while keeps citing the legend in hush-hush tones within private clubs. From John's eyes, we can feel his loneliness ... having everything and knowing everything while losing the only thing he cares about in his life. All because of the stupid son of his ex-boss. John is the legend. But he is not like the ones "telling" all CV's in your face. In the contrary, we will never knew if the thugs did not kill his puppy. Iosef and his gang thought it was a fair game for John refused giving in the Mustang. They just did not know it was not about money. The car and the puppy were the only remaining things that connect him to his late wife. By taking them away, surely Iosef has awaken the legend from his long sleep. It is almost like an inverted version of sleeping beauty, actually. The happiness ends when it is time to wake up. Thus, shall begins all of the unexpected mess. John slammed the hammer on his basement floor to dig everything he had buried in the past. His rifles, knives, pistols, machine guns, boxes of bullets, and hundreds coins of gold ... the only currency for assassins business. At this point, one begins to wonder ... who is this guy we are watching here. It only adds to the mystery as we watched him taking shower almost like a ritual ... like a part of holy action. With tattoo's in his back, "Fortis Fortuna Adiuvat," now we may suggest a connection with the Navy ... or John has understood that "fortune favors the bold." Not long after that, suddenly the melancholic and serene life we had watched in the first 10 minutes has now turned into a nightmare. 12 men broke into his house ... in which John waited with a long list of strategy; welcoming unwelcome guests with endless blasts of gunshots, noises of broken bones, and splashes of blood on the walls. And all of these people are wearing three-piece suits, by the way. As soon as he starts, there no turning back. That is why Viggo got really pissed off on his son ignorance for what he does. Viggo knows John. He made the legend. He created the ghost, the "Baba Yaga". Viggo was the one giving an impossible task, of which John accomplished in turn for leaving assassin life for a love of a woman. Now he returns, without wanting to be part of it ... no one expecting a hug. Only hoping to save their own lives from his coming. By the end of the film, we know there are 78 guys failed to do so. Losing their lives. We know John does not after these people. It is Iosef he is looking for. But as much as Viggo has been disappointed by his only heir, we also know that he has to protect Iosef in order to become a responsible father. I see this a bit sad since I have the impression that Viggo loves John more than he does to his son. So, the last fight between him and John is actually the moment when everyone puts his cards on the table. They have nothing to lose anymore. They have no more reason to continue. John has lost his wife. Viggo has lost his son. The puppy has died. All of 78 bodyguards have died too ... so we see John walking away in a cold rainy night ... and feel pity for him. But, Hollywood has its tricks. Soon after that last scene, John met a pitbull dog. What!? This is my first movie review that I like. You are able to write an interesting review Embun, even for me who don't love n watch movies a lot, I can enjoy this review. Can't wait to read your next review on Jhon Wick 2. Don't worry about your husband regarding Keanu. Thank you Mr. Ruly, I am still learning ... especially still looking for a way to write a review without giving too much details about the story.